Diamondback bikes have long been a great option for riders searching for good looks and solid performance in a mid range price bracket. From their humble beginnings as a BMX company, they have always kept their focus on quality no matter what the price point. This has meant that even entry level bikes have been well built and have looked good. In the current market Diamondback still have a great name for quality and style, Today we take a look at the sleek and stealthy Diamondback 2013 Overdrive V 29’er. One look at this bike and you know you’re dealing with a serious bike, despite the relatively low outlay. Sitting on impressive 29 inch rims, there’s an aggressive stance, and the all black stylings really add to the lean and menacing tone. Up close and personal and first impressions are still good. The bike, despite appearances, is light, thanks to a real high quality lightweight butted 6061-T6 aluminium frame. The large 29 inch wheels may help to make this a bike that stands out in a crowd, but it will also help when attempting to overcome obstacles on trail runs and perhaps some more challenging terrain. On the bike and we’re still impressed. The 29 inch wheels really do mean that you pass obstacles easily. No matter what you come up against, you’ll tackle it with far more ease than you might do with smaller tyres. It also means that the general ride feel is improved, with a sense of being ‘in’ the bike, rather than on it. While the frame is lightweight, we’re reassured by the manufacturers claim that there’s not much tougher out there. The butted 6061-T6 is airplane grade aluminium, and goes through a special heat treating process which gives the frame extra strength. There’s great compression from the spring mounted forks, with around 4 inches of give, which allows you to tackle all sorts of surprise obstacles without coming a cropper. Starting and stopping is pretty spectacular on the Overdrive too. With 24 gears in the standard mountain bike configuration, you’ve got plenty of options, and being driven by Shimano’s Altus set up, it’s reliably smooth. Mechanical Disk Brakes of course mean that stops are as abrupt as you need them to be. There’s no doubt about it – Diamondback have stepped up to the plate again and have delivered a remarkably impressive bike for the money. First of all the looks are to die for, and easily matches up to far more expensive bikes. Secondly, it does pretty well in terms of specs too. You’re getting a well built, light weight bike with good gears and brakes for something approaching budget level price. A resounding success considering this superbly put together bike can be bought today on Amazon for a remarkable $337.55. 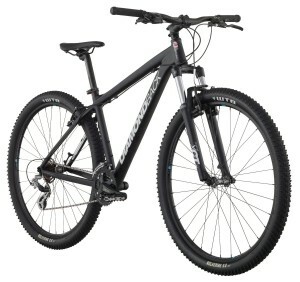 This entry was posted in Bikes, Diamondback, Mountain Biking, Reviews and tagged 2013, Diamondback, Mountain Bike. Bookmark the permalink.